George Lampman, a young American marine attached to the American embassy, remembers that when he arrived in Korea on January 9, 1949, the American PX (Post Exchange) was in the Wha Shin Department Store. But it didn't remain there for long. The American military presence in Korea was being reduced and a large PX was no longer needed or feasible. The solution was to move the PX to the second floor of Dongwha Department Store. The Dongwha Department Store had an interesting past. During the Japanese occupation of Korea, it was the Mitsukoshi Department Store and was one of the most popular shopping venues in Seoul. It was famous (or infamous ― depending on your view) for catering to the wealthy ― providing them western clothing, cosmetics and various luxuries including musical instruments and gramophones. It did brisk business and averaged between 5,000 and 8,000 customers daily. Not only did it provide material goods, it also provided a venue for people to show off their sophistication and wealth. Its large restaurant served Western-style dishes prepared by its own cooks and, despite the cost, was often filled to its capacity (130-150 seats). There was also a roof-top garden that the elites of Seoul patronized not only for drinks but also to be seen. With the liberation of Korea in 1945 came the liberation of the building. Lee Byung-chul acquired the building and renamed it the Donghwa Department Store. In late 1949, the American PX was moved in and ran smoothly until the start of the Korean War. According to one source, on the night of June 25, or early the following morning, the doors of the PX were thrown (forced?) open and "an orderly looting took place." Jewelry, cash and all types of merchandise vanished. 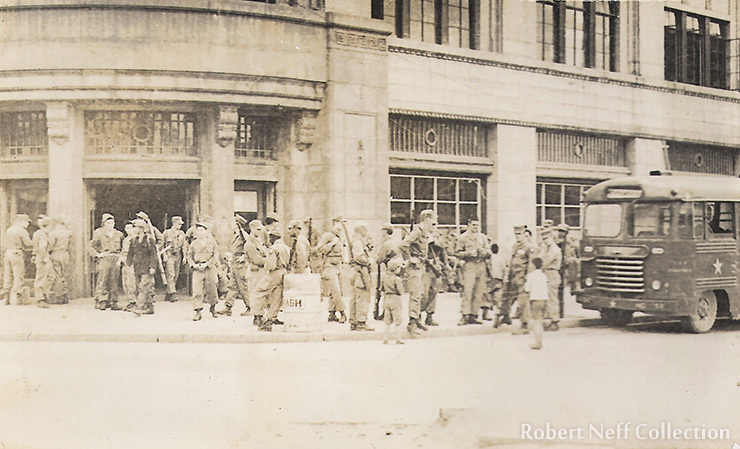 When the North Koreans occupied the city on June 28, they probably found little, if anything, in the PX. With the recapture of Seoul by the UN forces the PX was re-established in the building where it remained throughout the Korean War and for several years afterwards. Finally, in 1963, it was renamed Shinsegae and remains one of Seoul's largest and most popular department stores.